Need an Oil Leak Inspection? How Much Does an Oil Leak Inspection Cost? 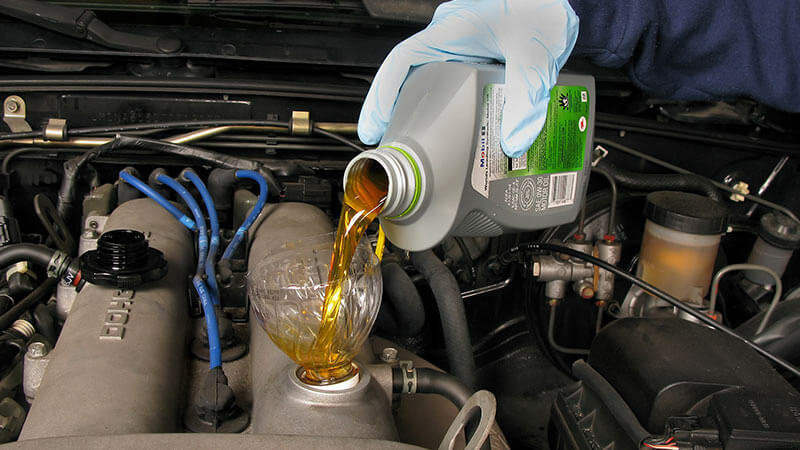 Motor oil is the lifeblood of your engine. It not only lubricates all the moving parts inside the engine, it also removed dirt and debris from inside the engine, and transfers heat away from the main moving components. If oil is leaking from your engine, it can cause expensive and irreparable damage to internal components especially if level inside the engine is dangerously low. Oil can leak from different areas on the engine, and it can sometimes be hard to determine exactly where the leak is coming from. How does the Engine Oil system work? The oil begins its journey through the engine in the sump, also known as the oil pan. This sump is located on the bottom of the engine and stores the oil when the engine is not running. When the engine is started, the oil pump picks up the oil from the sump and circulates it throughout the engine through oil galleries inside the engine block and cylinder head. Once it has reached the top of the engine, it makes its way back through the engine, through the oil filter and back into the sump, where the process begins again. Failed Gasket: Many engine components are sealed by rubber or plastic gaskets to keep the oil inside the engine. Over time, these gaskets can perish and fail, causing an oil leak. Some gaskets are simple to replace, while others require dismantling of major parts of the engine to get to. Stripped or Leaking Drain Plug: Most engines have a drain plug on the bottom of the oil pan, to make changing the engine oil a simple process. However, it is removed and refitted quite frequently, and if any dirt or debris get caught in the thread, or the gasket is not replaced properly, it can cause an oil leak. Internal Oil Leaks: If you are noticing blue smoke coming from your exhaust when you first start the car, or when you are driving, you may have an internal oil leak. This is where the seals inside the engine degrade enough to allow oil to enter the combustion chamber. This oil is then burned, creating a cloud of blue smoke. Failed Oil Filter: The oil filter is recommended to be replaced in conjunction with every oil change. If it is not replaced, or the old oil seal is left on when the new filter is fitted, it is possible for the filter to not seal correctly and leak oil. What’s Involved in the Oil Leak from the Engine Inspection? Our mechanics will inspect the engine of your vehicle to determine where the oil leaks are coming from, and provide a quote to carry out the necessary repairs to rectify the leaks. Oil leaks that are left unchecked can get onto rubber hoses and other engine components and damage them, as well as leave ugly stains on your driveway. Not to mention it is an environmental hazard! Oil leaking onto hot components can also cause smoke, and in extreme cases, engine fire. It is imperative to have your vehicle inspected and diagnosed as soon as possible.